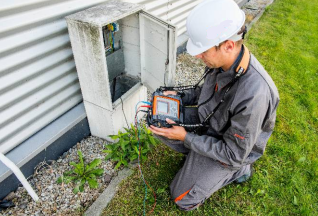 With the AMRU-30 earth resistance meter can be made measurements of the earthing by the technical method of the 3-poles, the 4-poles and with the use of additional clamps. It is also possible to measure the continuity of the equipotential and protection connections with automatic zeroing function with a current of 200 mA. 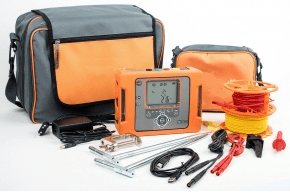 Another available measurement is the resistivity of the ground and the measurement of the grounding by the method of two clamps without the need to place the auxiliary electrodes. 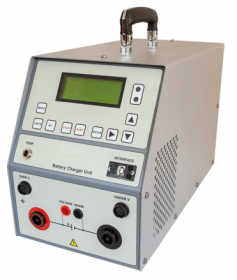 The equipment allows the selection of the maximum measurement voltage (25 V and 50 V) and the introduction of the distance between the electrodes for the resistivity. The meter also has memory for 990, which can be exported by transmitting the data to the computer (USB). Includes calibration of the measurement clamps. The electrical safety of the equipment, in accordance with EN 60529, is IP65, with double insulation according to EN 61010-1 and EN61557 and the measurement category is CAT III 300V according to EN61010-1. Measurements of resistance of the earthing with the use of auxiliary electrodes. Measurements of resistance of the earthing with the use of auxiliary electrodes and clamps (to measure the multiple grounding). Resistance measurements of the earthing with the use of double clamps (to measure the grounding when it is not possible to use the auxiliary electrodes). Soil resistivity measurements (by the Wenner method). Continuity measurements of the protection and equipotential connections (which meets the requirements of EN 61557-4 with automatic zeroing function - with a current of 200 mA). Measurement of the resistance of the auxiliary electrodes RS and RH. Measurement in the presence of disturbing voltages in the networks of a frequency of 50 Hz and 60 Hz. All the necessary cables to carry out the measurements (finished in banana plug, cable in coil, cable of data transmission). Probe for measuring on the ground (30 and 80 cm), tip probe with female plug, emission and reception probe. Crocodile clip and screw clamp. Software for the creation of documentation. Power suply to charge the batteries (cable to charge the batteries to the car cigarette lighter). Case for the meter, probes and accessories.